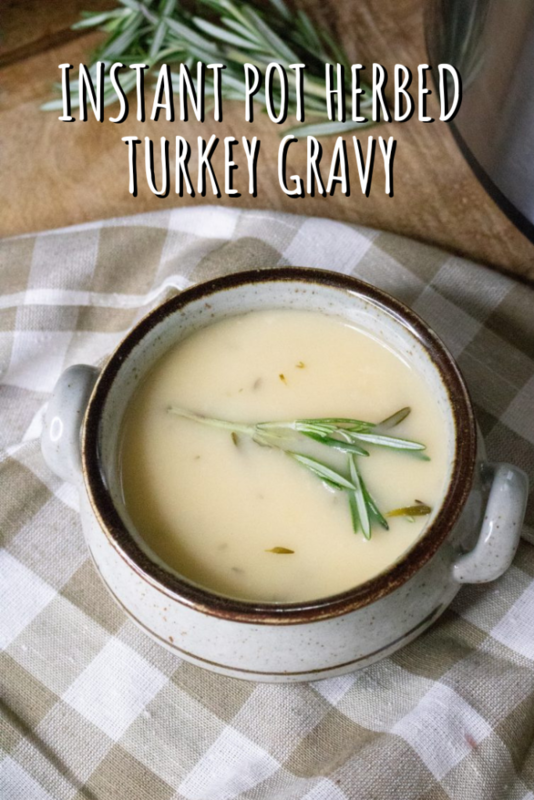 Quick & easy for Thanksgiving dinner, this Instant Pot herbed turkey gravy is a foolproof gravy recipe that is chock full of flavor. 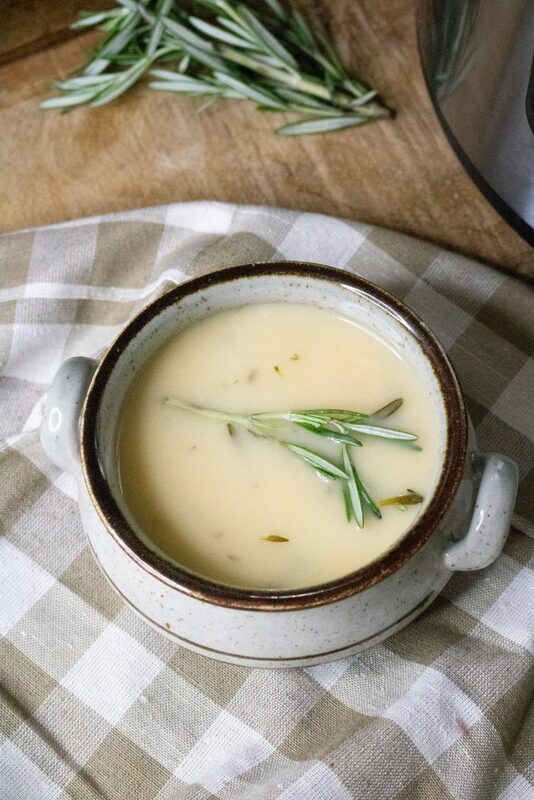 The fresh flavors of rosemary and thyme make this gravy the perfect topper to mounds of fluffy mashed potatoes, stuffing, and of course turkey. Better yet? 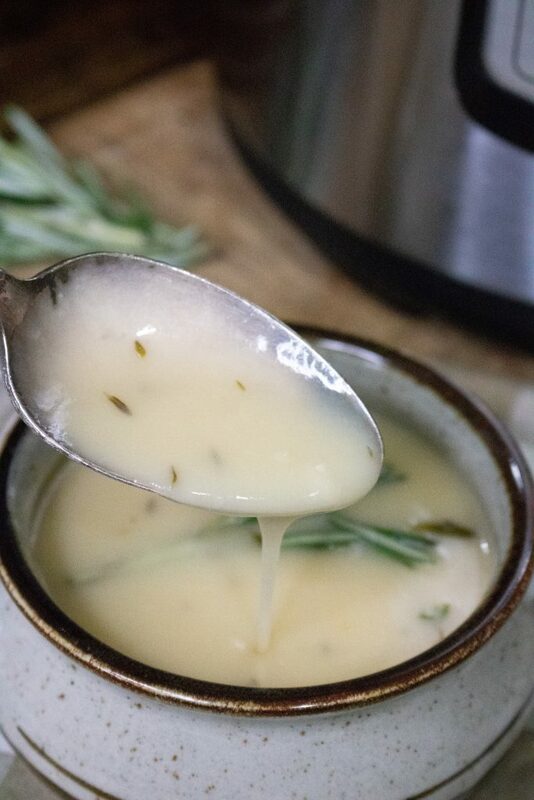 This luscious gravy is ready to go in under ten minutes and you won’t have to break a sweat stirring to make sure it is perfectly lump free. Thanksgiving is right around the corner. My kids are getting excited. And really so am I for mounds of turkey, fluffy mashed potatoes, and savory stuffing. 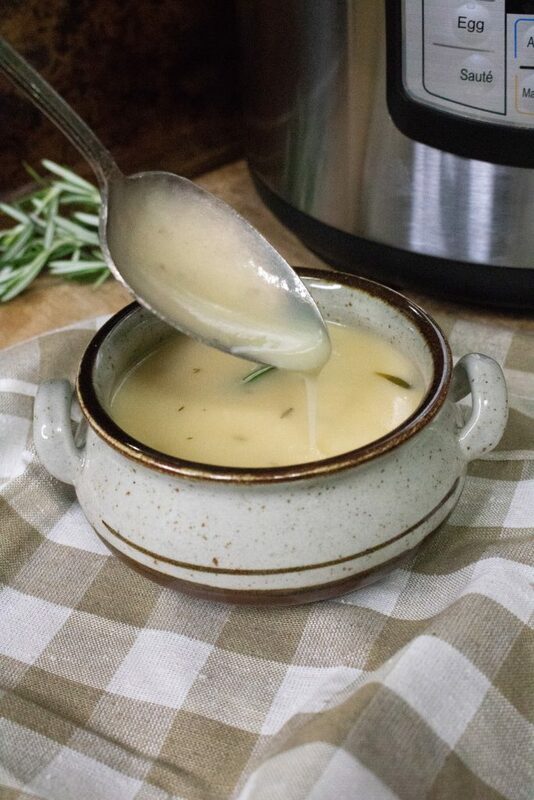 All drenched in this yummy, easy Instant Pot herbed turkey gravy. I must admit, I have some serious love for anything that makes prepping for a big Thanksgiving meal easier. The Instant Pot does just that. I’ve already told you how easy it is to make an Instant Pot turkey breast. 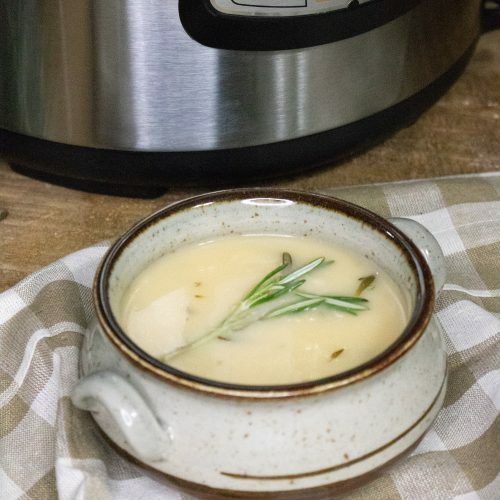 This Instant Pot herbed turkey gravy is just as easy. And, like the Instant Pot turkey breast, its perfect for smaller Thanksgiving gatherings as well when you don’t necessarily want to make the humongous bird. Plus, just like the Instant Pot frees up the oven while the turkey breast is roasting to delicious perfection inside it, it frees up the stove too so other sides can simmer away if needed. Doesn’t it always feel like you never have enough burners on Thanksgiving day? Or at least that’s how I feel. This gravy definitely frees one of those burners up without sacrificing the taste or silky texture of the gravy. The gravy is so easy to make, too. 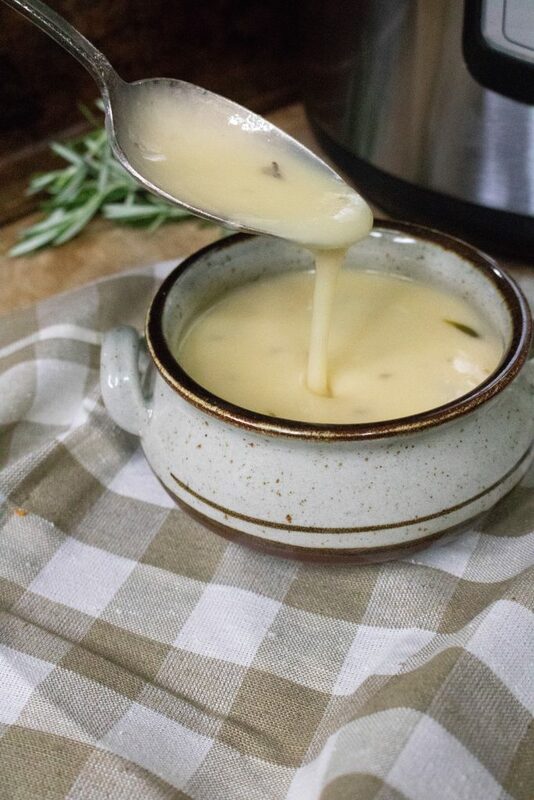 No need to fuss and stir over a hot stove to make a perfect gravy with this turkey gravy recipe. The recipe calls for just a handful of ingredients: turkey stock, butter, flour, and the fresh herbs. And for the turkey stock, you can use the fresh strained turkey drippings or you can shortcut it even more and used canned stock. How low maintenance is that? And just wait until you hear how easy it is to prepare. Just turn the Instant Pot onto saute mode and make your roux with your butter and flour. Stir them together until they form a golden paste. Then add the herbs and enjoy that glorious smell of buttery herbs for a second before you add your turkey gravy and turn the Instant Pot off of saute mode. Then put on the Instant Pot lid and turn the pressure valve to seal the pot. Cook the gravy on manual high pressure for four minutes. Yes, you read that right. FOUR minutes. This gravy is ready lightening fast. See? Low maintenance. Barely any stirring. So much better than doing the traditional stand at the stove and get an arm workout trying to keep the lumps out of the turkey gravy move. Last, just do a quick pressure release and then stir gravy. If you want additional thickening, turn back on to saute mode and cook for an extra minute or so. And then before you know it, you’ve got this showstopper on your table ready to top off all of your Thanksgiving day goodies. 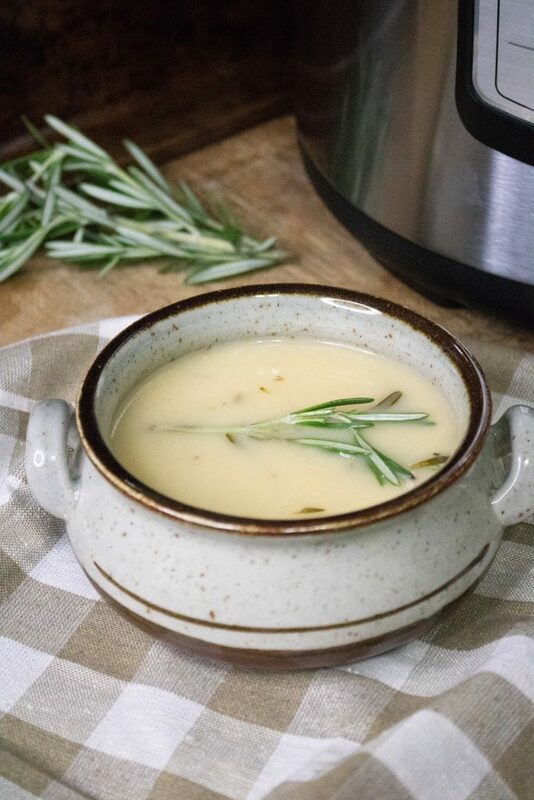 A quick & easy, lump free, fool proof gravy recipe made in the Instant Pot- this version's perfect for Holidays, for ladling over Turkey, mashed potatoes, even your Grandma's biscuits. If using fresh stock, strain before using. 3.Close the instant pot lid and turn pressure valve to seal. Cook on manual high pressure for 4 minutes. Turn the Instant Pot on saute mode and add butter and flour to the inner pot. (For a thicker gravy, use an additional tablespoon of flour). Stir to combine well. Add in the fresh herbs. Pour in the turkey stock and stir until smooth. Turn saute mode off. Allow for a quick pressure release and then stir gravy. For additional thickening, turn back on to saute mode and cook for 1-2 minutes. I haven’t tried turkey gravy. This version sounds so tasty!! I would love to enjoy this with roast turkey – yum! Thanks for sharing at Fiesta Friday party! Looks like a perfect recipe for gravy if you have an insta-pot. Happy Fiesta Friday and thanks for sharing.